Thailand Premier League side Bangkok United have agreed terms with the prolific Bahrain international Jaycee John Okwunwanne. The financial terms and duration of the contract that has been signed by the attacker were not disclosed by the 1996 champions. Okwunwanne was playing non – league football for Osaka FC Lagos before he departed his homeland to join Bahrain side Al Ahli in 2004. He scored plenty of goals for Al Ahli and later Al-Muharraq SC, and the authorities had to fast – track his application for citizenship to enable him play for their national team. For the Bahrain national team, the striker has appeared 60 times, scoring 25 goals. 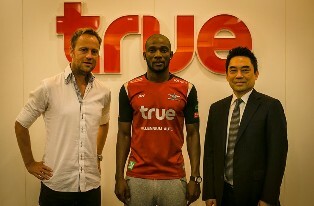 Jaycee John Okwunwanne will be presented to the fans today in Bangkok United’s clash against Chonburi. He has been handed jersey number 22.